My aforementioned (novice) assistant was forthwith plunged into the intricacies of correlating website printouts with microfilm numbers and proved herself adept at reading tiny print on 8mm film boxes. She also shined at quickly catching on to document numbers on the reels, and instantly catching the death date on each frame. I don’t know if this is a good way to train a new generation, but it worked for me. One of my Hector McFadyens (oh yes, there’s more than one Hector, what did you expect?!) died in Kamloops, BC, in 1944. This Hector is a black-ish sheep and will have a separate post if I can ever uncover the last 20 years before his death. Maybe even if I can’t. I’m grateful for some answers to my Questions in “McFadyens Part 7” thanks to fellow McFadyenite Ian Scott in OZ. Many interesting Coll projects have bloomed from Australia and are a boon to descendants around the world. Keith Dash maintains the twin websites, Isle of Coll Genealogy and Isle of Tiree Genealogy. Ian Scott is a big contributor to the transcribing and indexing projects on these sites. Not to take away from the many volunteers who also contribute, but these OZ guys have been particularly helpful and patient with me. I am at a disadvantage, probably lamented before, because I don’t have the microfilm parish register at hand. My Q #1: Were the lists of babies and marriages in the Kirk Sessions then recorded in the Old Parish Register (OPR) for Coll & Tiree? "What is contained in this and fifty three preceding pages is a true copy of the Register of Marriages and baptisms for this part of the Parish of Tyree, being the period for Marriages from 23rd July 1776 to 1st June 1813 and for Baptisms from 14th April 1776 to 26th April 1813 inclusive, copied out in terms of the Act of Parliament, this Register being mixed up with Sessional matters." Presumably from then on all baptisms and marriages were recorded in a parish book rather than Kirk Session minutes. Or both. Thank you, Ian Scott, for clarifying this. My Q #2: Are Coll & Tiree OPRs actually included on the IGI (International Genealogical Index)? A: The answer to this question follows from the above. Yes, we know the LDS microfilm crew did film all the Scotland OPRs. There must be a reason why I can’t find MY five alleged McFadyen baptisms on the IGI. I promise I will not continue this dithering unless some solution penetrates the fog. Regarding the work of the wonderful OZ guys, on the same library trip we found a Hector from Tiree born about 1819 who died in BC. Oh that he would be mine, sigh, but I’ll get right on it and post it to the Tiree mail list. Let it be known that I consider OZ a term of affection, just in case it has any local unpleasant connotations I don’t know about. 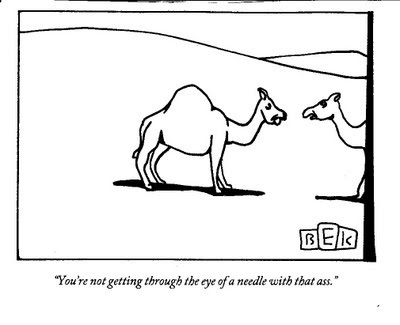 The New Yorker, 11 May 2009; courtesy of a friend-subscriber. Milestones seem to be hurtling by with no respect for the timing of my research plans, priorities, goals and daily task lists. I've heard there are genealogists who manage their time in a healthy balance of relationships, children, pets, and outside interests while still making progress on the family history or whatever their chosen way of volunteering information and education. Do the rest of us genie workaholics with tunnel vision need a life coach to smell the roses? Or a Dr. Phil consult? Life milestones mean reviewing the priorities. One must review the priorities regularly. Mine have a sneaky habit of shifting before I know what’s up, something like the contrary milestones. In order to assume control and rectify my balance, I make lists for acting sociable and normal. Speak to my neighbours in the elevator. Go to meetings. See that movie. Stroll the yard sales. Attend parties. Dance at festivals. Ask strangers on the street for wi-fi spots. Invite someone for a glass of red wine. Cancel that if they have a smoke allergy. Make friends with people who think genealogy is a medical accident, ... if they ever think of it at all. To accomplish all this requires memorizing a short list of non-genealogy topics. In the excitement of committing to healthy normal again, I propose to take time off and visit one of my offspring. Call it spending some time with the living instead of the dead. Give my Scottish correspondents a break. Truthfully, I try to make family visits on a regular basis, but as I said on Facebook, the closest is 1,264 km (785 miles) away. Canada’s east coast, west coast and Europe have to take their turns. Therefore, no posts for a bit. Not that I’m known for over-activity in this medium. But I always have an ace up my sleeve to prove I’m not a myopic one-trick pony. The elephant in my room is the camel, to mix several metaphors. Good excuse for another photo. Full circle. 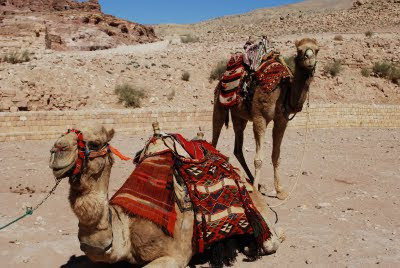 Camels in Petra, Jordan; photograph by Francine Mulherin, 2009.